It’s party time with this bread dippin’ spinach dip. It’s one of our favorite snacks for race day or game day. And it’s easy to make. 1 large round bread loaf (I like using sourdough, but neo-Tuscan Boule is just as good. The Southern Redneck version of Wonton Wraps. Or what we like to call, Plain and BBQ Chicken Stuffers! A quick and easy appetizer to serve at any party, race day or game day event. Or just for a light summer dinner. Serves: 10 to 20 @ 2 to 3 stuffers per person. 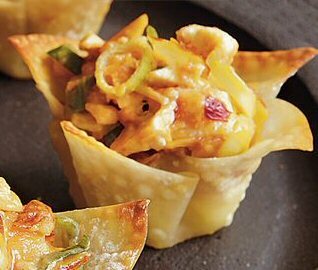 There are two steps to this appetizer, the filling and the shells.